As the Starlight Music Series at the Top of the Rock Observation Deck prepares to kick off on February 12th, Devin Bing and his band “The Secret Service” are set to close out this fantastic calendar of performances. With a fulfilling mix of music, drinks and a picturesque view of New York City from the top of the famed Rockefeller Center, it’s the ideal setting to take in NYC in its entirety. Visit the 67th floor at Top of the Rock Observation Deck on February 12th, 14th, 19th & 26th to experience the winter music showcase. Enjoy live music while taking in the spectacular, 360-degree panorama of New York City. Wine and champagne will also be available for purchase from The Sea Grill. 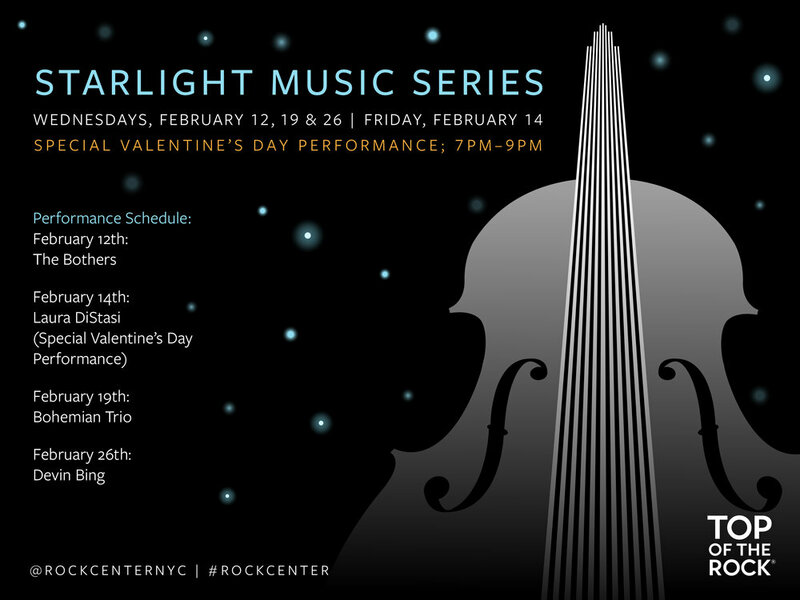 The Starlight Music Series is free with the price of admission to Top of the Rock. For the musical lineup and to purchase tickets, visit topoftherocknyc.com or call (212) 698-2000. Top of the Rock is open daily from 8:00 a.m. to midnight, with the sky shuttle making a final run at 11:00 p.m. Tickets are $27.00 for adults, $25.00 for seniors and $17.00 for children six to 12 years old. Children 5 and under are free. Devin Bing & “The Secret Service” LIVE at the Metropolitan Room Part Deux Finale Show…Don’t Miss!